"It takes a really well published magazine to catch my eye (or my purse!) in these days of proliferation of publications on the bookstalls but I must confess that I find the new MECCANO ENGINEER an absolute knock-out. This must be the best ever post-war Meccano magazine for the Meccano enthusiast and I found every page of real interest." The (Junior) Meccano Engineer, official journal of the Society of Junior Meccano Engineers, Henley on Thames, was edited by Mike Nicholls and published by MW Models. "Design for Joy" by Andreas Konkoly, and other series were started in it and later continued in Meccano Magazine Quarterly when Mike Nicholls became editor. Unlike the Meccano Magazine, most content is Meccano-related. All 12 issues of the (Junior) Meccano Engineer are now available on CD, with printable quality scanned images of every page, with electronic Author, Chronological, Subject, Keyword, Monthly Table and Cover picture indexes to articles and complete issues. 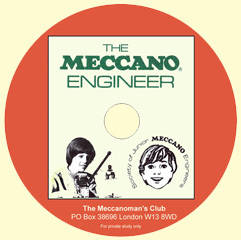 The CD also includes the SJME publications "Meccano Parts Handbook" and "Meccano Parts Checklist" in their entirety. All royalties from sale of the CD are donated to the Across Jumbulances charity.